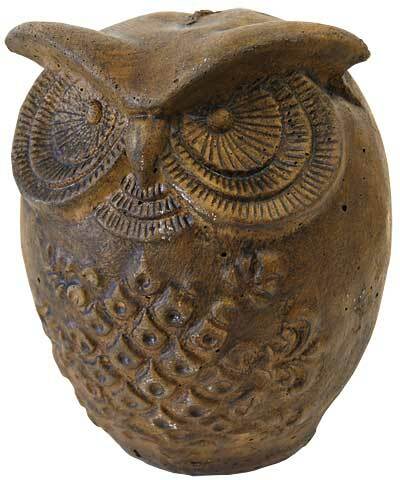 Brilliantly adorn your garden or home with this Athens Espresso Wise Owl Statue. Large, textured eyes, a heavy brow, and small beak shape create a classic owl visage, furthered by the rounded body with tapered base. The deep brown hue meshes with your landscaping, and black accents aid in defining the textured body. Raised teardrop shapes on the bird�s chest evoke feathers, and the straightforward eyes make it appear that the figure is guarding over the yard. Its all concrete construction forms a robust sculpture, and its base rests on a level surface virtually anywhere. Place the item in your yard through the warm months to act as artwork and a stylized scarecrow, and move it indoors in winter for protection from the cold. Sagely decorate your bookcase or garden using this Espresso Wise Owl Statue.